In small bowl, sprinkle gelatin over cold water; set aside to soften gelatin. In 2-quart heavy saucepan, heat whipping cream, milk, sugar and vanilla over medium heat to simmering, stirring frequently until sugar is dissolved. Remove from heat. With whisk, stir in softened gelatin until completely dissolved. Cool to room temperature, about 15 minutes. Place 2 raspberries in bottom of each of 8 shot gasses. Divide cream mixture evenly among glasses. Refrigerate until set, about 2 hours. 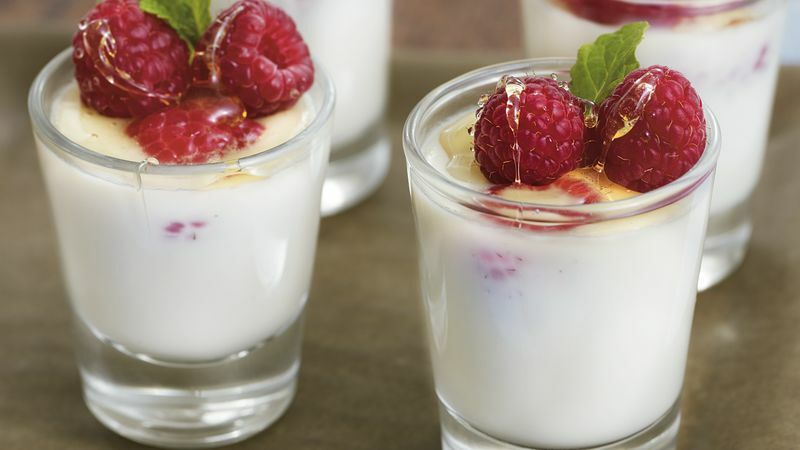 Just before serving, top each panna cotta with remaining raspberries and 3/4 teaspoon honey. Garnish with mint. When ready to pour the panna cotta into the shot glasses, use a small funnel. It will make it easier to pour and keep the glasses clean. You can steep the cream mixture with fresh herbs, such as chamomile or lemon verbena, for a different flavor. Strain before dividing into the glasses.